My love of trees is becoming very well known now – I now get sent all sorts of tree related links. I’m glad she did as it reminded me of this wonderful website – Primera Escuela. Clare had actually linked to a page entitled Las árboles, a whole page of activities linked to trees. What a joy! You can ‘contar bellotas‘ (count acorns), make a tree from shapes – un árbol de formas – colour in a tree online – colorear en linea – or do an online jigsaw – rompecabezas. And there’s a link to the Universidad de Illinois ‘Los árboles son fabulosos…aprende más con Pedro‘ Pedro is an acorn who teaches you all about trees. 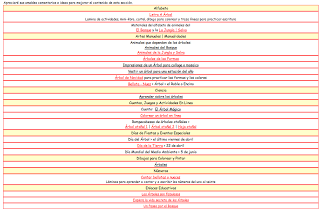 A great resource for CLIL lessons interesting science and Spanish. Particularly catching my eye were the resources linked to the Winter Olympics – very topical! There are colouring pictures and posters for all the events at the Juegos Olímpicos – that would’ve saved me trying to act out luging on a tray! !